Pavers are an indispensable tool for designing outdoor living spaces and commercial pavement solutions alike. But if you’re not familiar with permeable pavers, you’re missing a growing market segment. 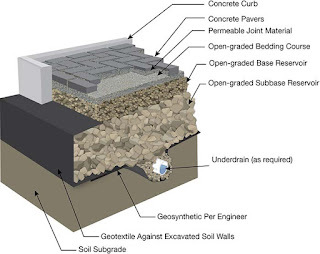 Permeable pavers, also known as permeable interlocking concrete pavement (PICP), provide stormwater management by reducing runoff volume and rate, filtering pollutants and keeping water on site without the necessity of retention ponds. They’re key players in sustainability and low-impact development. With additional design techniques, water collected from PICP can be retained in a cistern for watering plants, washing cars, or directed to an alternative storage container. PICP has been used in Europe since the late 1980s, making its first appearance in the United States in the early ’90s. Basically, permeable pavement consists of pavers with joints filled with aggregate so that water flows through the surface like a grate straight through to the groundwater.